After winning two Temporary Restraining Orders blocking grizzly bear hunting in Idaho and Wyoming, Western Watersheds Project and a host of tribal, conservation, and animal-rights plaintiffs have won a decisive victory that returns the protections of the Endangered Species Act (ESA). WWP is proud to stand strong for the grizzly bear, speaking out on behalf of a magnificent wild creature that cannot speak for itself. Grizzly bears were removed from the threatened species list in 2017. The U.S. Fish and Wildlife Service created a new ‘Distinct Population Segment’ (DPS) of Yellowstone bears for the purpose of speeding up the removal of federal protections, and moved the goalposts of the Recovery Plan – deleting the requirement that grizzles become reestablished in the Selway-Bitterroot backcountry to provide linkages between grizzlies in Yellowstone and populations in northern Montana – to create an illusion of “recovery” for a Yellowstone grizzly population that remains below the threshold of genetic viability. Earlier in 2017, there was an important legal ruling, which returned western Great Lakes wolves to ESA protection. This case was based on the U.S. Fish and Wildlife Services’s failure to examine the nationwide status of wolf populations and historic shrinkage of their range. By creating a Distinct Population Segment of wolves to de-list them, the Service left the lower 48 states’ remaining wolf populations as an unlistable entity, neither a species, subspecies, nor DPS. At WWP, we recognized that exactly the same set of facts and legal violations also applied to the de-listing of the Yellowstone grizzly. This turned into the heart of our lawsuit, and also figured prominently in the legal actions brought by all the other plaintiff groups. Now that the de-listing of the grizzly bear has been vacated by the court, this population returns to ‘threatened species’ status. This prohibits them from being killed, harassed, or harmed by the general public, thus preventing trophy hunting. It will be up to WWP and other conservation groups to seek to prevent the USFWS-sanctioned killing of grizzlies (or relocating them, which most frequently results in the death of the relocated bear) in cases where cattle become grizzly prey, or even show up in the same areas. Western Watersheds Project did not win this legal battle alone, but instead as part of a large and diverse team. Indigenous groups played a key role in the litigation, and many signed an international treaty together with Canadian First Nations affirming the religious significance of grizzly bears to their cultural traditions. And numerous tribal entities backed up this treaty with legal action, including the Crow Indian Tribe, Crow Creek Sioux Tribe, Standing Rock Sioux Tribe, Lower Brule Sioux Tribe, Ponca Tribe of Nebraska, Crazy Dog Society, Hopi Nation Bear Clan, Northern Arapaho Elders Society, the Northern Cheyenne Tribe. Environmental groups challenging the grizzly de-listing included Alliance for the Wild Rockies, WildEarth Guardians, Native Ecosystems Council, National Parks Conservation Association, Center for Biological Diversity, Sierra Club, and Western Watersheds Project. Animal rights organizations Humane Society of The United States and Fund for Animals filed a separate suit, as did a Northwestern University law professor filing as an individual. Legal firepower was brought by Western Environmental Law Center, Earthjustice, Fredericks, Peebles and Morgan of Louisville Colorado, a Northwestern University law professor, the Akland Law Firm of Missoula, and the Bechtold Law Firm (the attorneys who represented WWP, Alliance for the Wild Rockies, and Native Ecosystems Council). It is important to recognize all the tribes, organizations, and attorneys who advanced this litigation, as all share equally in being responsible for this great victory. WWP has a long history as a leading voice for grizzly protection in the Yellowstone ecosystem. We won a 2014 legal victory in which WWP and allies halted the killing of grizzlies within Grand Teton National Park in a misguided effort to make the Park safer for big game hunters. WWP’s fund has bought out more than a quarter million acres of livestock leases in northwestern Wyoming grizzly bear habitats, to help quell livestock-wildlife conflicts. WWP staff in Idaho, Montana, and Wyoming work tirelessly to advance the expansion and protection of Yellowstone grizzlies to restore this ecosystem to its original diversity and resilience. Now we can add the relisting of Yellowstone grizzlies to our successes. For those of you who are already our members, thank you for helping to fund this victory. We can’t win battles like these without your support. 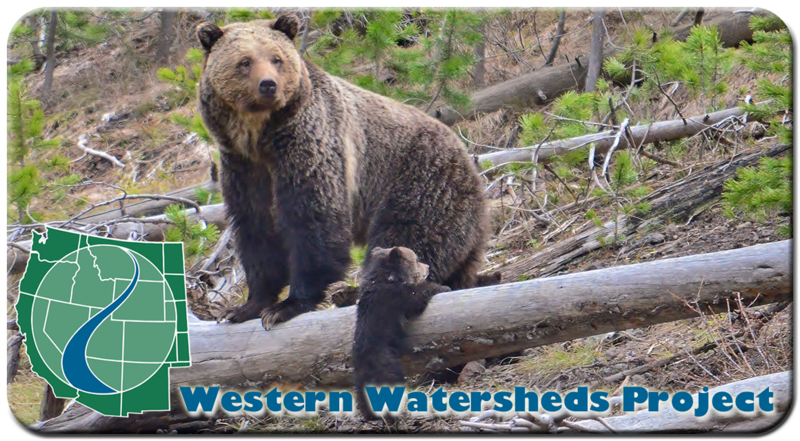 If you have been following our string of successes for a while but have yet to join, please consider a donation to Western Watersheds Project by clicking the button below. Donations can be anonymous.